HI! This is Neung (Pawannarat Katsuyama) and K (Atsuyuki Katsuyama). 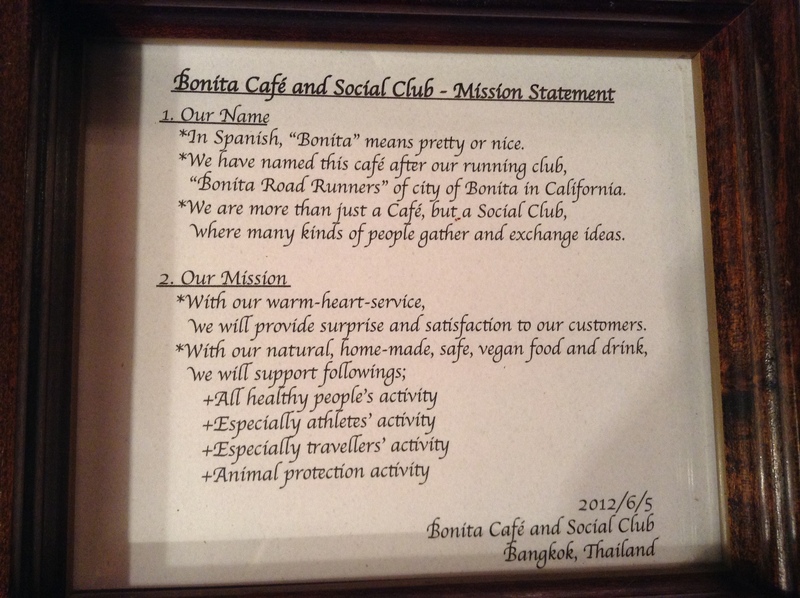 We started this small vegan cafe, in Bangkok, Thailand, on 2012 June 5. In 2015, K completed his life time achievement, USA CROSS RUN. K ran 5,026 km, from LA to NY, tracing entire ROUTE 66, in 79 days, from APR25 to JUL12. K could make this, thanks to his friends, sponsors and project team. During that time, we closed our cafe, for four months. Now, we re-opened our cafe. And, now, we are a member of ROUTE 66 CHAMBER OF COMMERCE, too. Also, K has become a management team member of ROUTE 66 ASSOCIATION OF JAPAN. With three cats, we are serving many happy/healthy/peaceful people from all over the world. We care about our quality of our food and service. WE ARE A PURE VEGAN RESTAURANT, in Bangkok, Thailand. We have our running club, THAILAND 100 MILES RUN CLUB, too. We believe in the healthy and ethical benefit of veganism. But, when we talk about our healthy life, we do not talk only about food. We believe our health is not brought only by food. Our health is brought by the good combination of food, exercise, rest and mind. That is why we are not just serving delicious vegan food. We serve peaceful space/time to our friends/customers, too. Also, with running activity, we are supporting our friends/customers. Our Monthly Natural Run Session is a joint project with Srinakharinwirot University’s Faculty of Physical Education, in order to promote healthy life in our Thai community. We write about our food, running and peaceful life in this website. We use this website as our communication tool with our friends/customers, too. This is about our name and our mission statement. Lovely cafe’, lovely food, lovely blog and best of all lovely owners! You know how much I have missed those kind and encouraging words of yours??? Thank you so much for being in this blog, sharing your kindness. Now, this blog has got another energy. Let me keep on writing. I miss you guys! Hope I can make it over early next year. Need some natural food, natural running and spend time with natural souls. WE, MANY OF US, miss you here in Bangkok. Yes, see you very soon early next year. Not sure if you remember me, this is Ian, the other one, and I am a member of Bangkok Runners. How are you? Thanks to you, I am now a lifelong advocate of VFF. I can’t run in anything else. Anyway, I am married now and my wife is vegan so I will try to pop by sometime to try your delicious food. Hope you, your wife and the cats are well. PS – any chance of your email address so I can keep in touch and congrats on your epic run across the USA. Thank you very much for your very kind note to us. We are glad that you are living happily, too. And, yes, let’s meet, too.